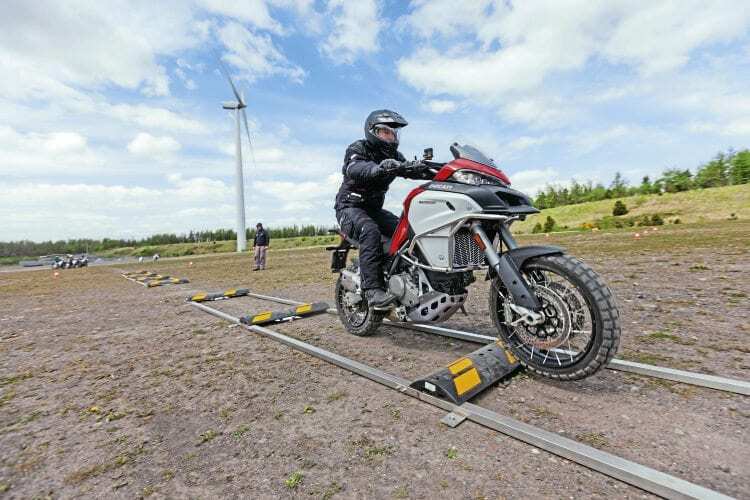 The thought of taking a £17,000 adventure bike off-road may seem more than a little daunting to most of us, despite the go-anywhere attitude of the bikes. But there is a smart way to get started if you fancy dipping your toes into the off-roading scene. The two things to secure from the start are high-quality coaching, and – most importantly – someone else’s bike! Some of the drills were demanding, but there were always trainers to help you through them. 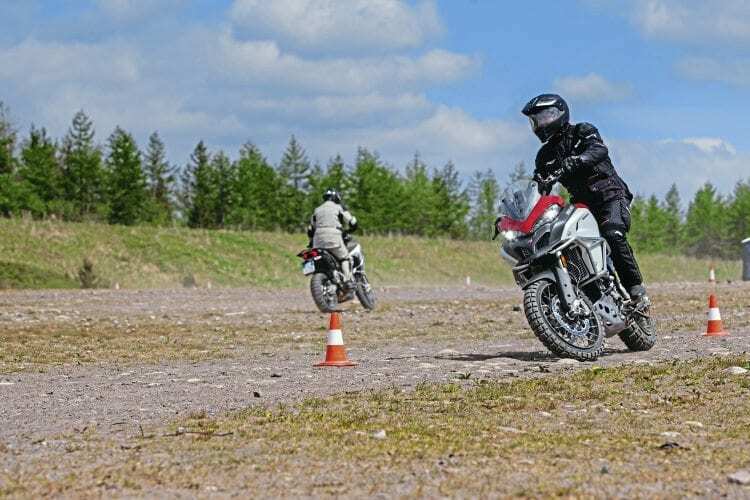 There are plenty of off-road schools backed up by bike manufacturers where you can sample their bikes and be guided by professional dirt riders. 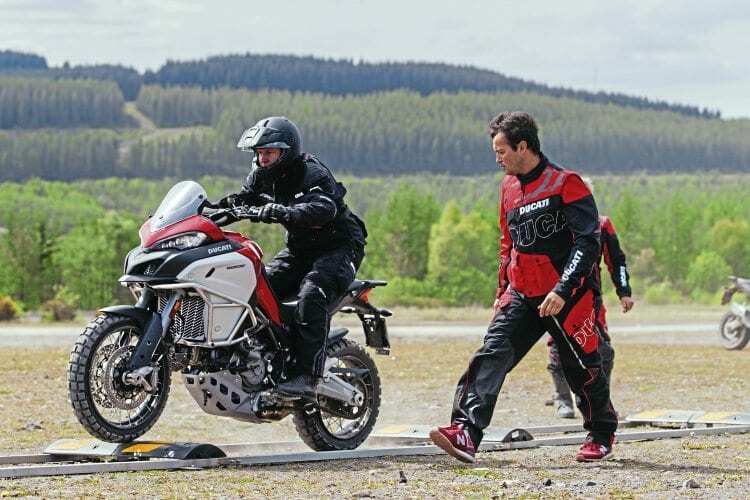 One of these is the Ducati Riding Experience Enduro, or DRE Enduro for short, which normally operates at luxurious surroundings in the Tuscan countryside in Italy. 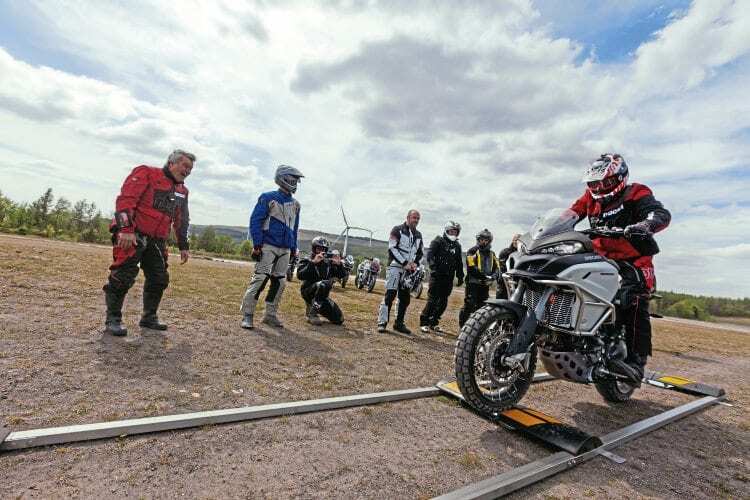 Luckily for us, they have a travelling taster version of the course that pops up at selected bike shows around Europe, and we managed to catch up with them at the Touratech Travel Event in Wales. 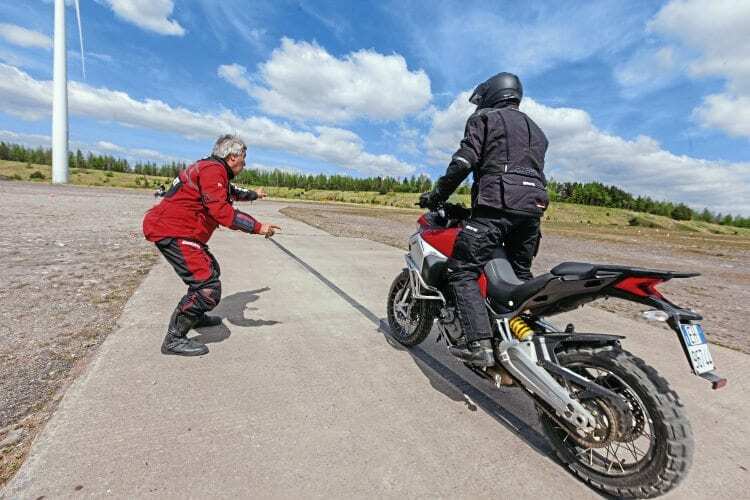 The Ducati trainers demonstrate each drill first – this is how it’s done. The taster session (or ‘aperitivo’, as the Italian trainers called it) consists of about an hour of skills drills on an obstacle course, followed by a shortish trail ride to let you put all your newly acquired skills into action. 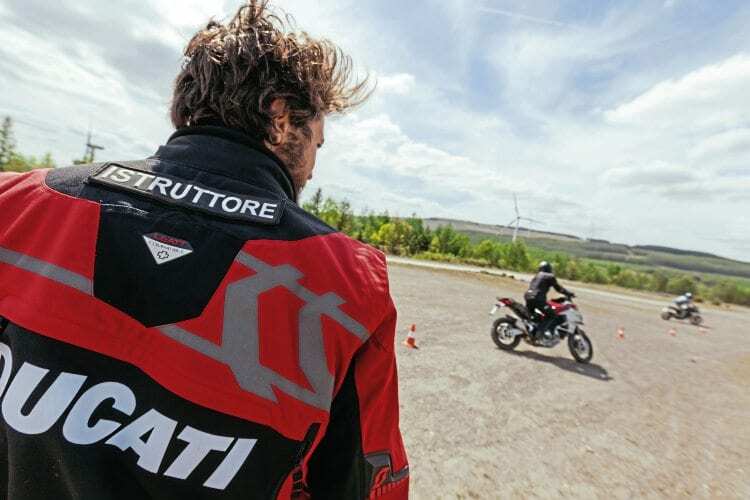 They use the same Ducati Multistrada 1200 Enduro as the school in Italy, and the best thing: it’s completely free! Beppe shows how to approach the fake logs. That’s right, bums out! 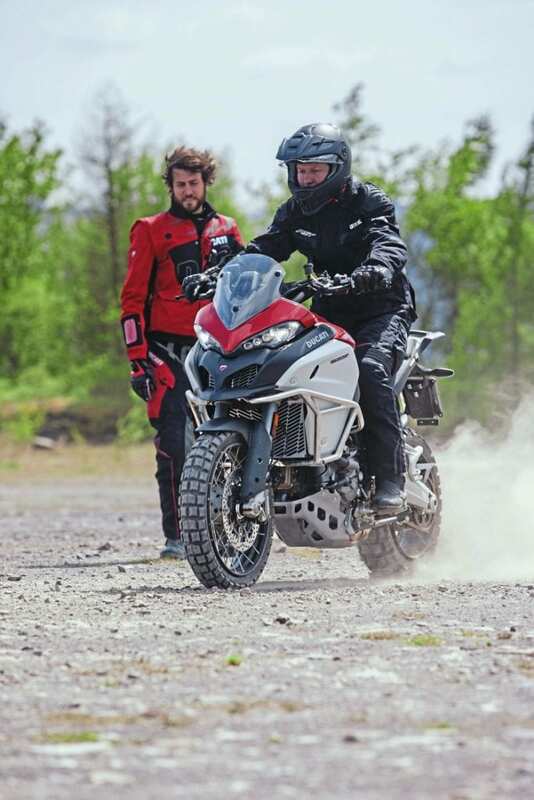 After introductions, we were given a quick run through of the bike that we would be using: the 150bhp, 1200cc L-twin Multistrada Enduro – at first sight, quite a beast to tame and coax around the training ground. The bikes are exactly as they come from the factory apart from knobbly tyres and crash bars (very wise), the mirrors have also been removed, and the ride mode is set to Enduro, which cuts power to 100bhp, allows the rear wheel to lock and reduces the level of traction and wheelie control. The bikes weigh 200+ kilos, but with the clever weight distribution, they feel pleasantly light and agile. You need to move your body quickly to avoid the bumps sending you off course. The enduro school is run by Beppe Gualini, the first Italian Dakar rider, who brings a wealth of experience to the training. The first drill that he got us doing was a slow-speed slalom. The trick was to move your body weight to the opposite side as you would when riding on the road. By standing on the pegs and leaning left when turning right and vice versa, you give the tyres more grip on gravelly surfaces. It looked easy when the trainers demonstrated it, but getting your brain and body to move in a way completely opposite to what you have been doing for years was not quite as simple as you might think. After a few wobbly attempts my technique started to improve, but I was still miles away from the effortless elegance that the trainers demonstrated. The next step was riding over uneven surfaces, with your body weight towards the back of the bike so the front wheel doesn’t bite into the grooves and throw you off. Leaning back was more difficult than it sounds too, as it is almost impossible not to sit on the tall pillion seat when your arms are fully outstretched and your bum sticking out. In the end, this also got easier, but again I felt that the full experience in Tuscany, with more time for each of the exercises, would be beneficial. This is just a taster, after all. Once we’d managed moving forward it was time to practise stopping – and stopping fast! Emergency braking meant leaning your weight back and locking the rear brake. Once you were comfortable with this, the next step was to add a bit of front brake without losing the front and tumbling down. With the weight away from the front wheel, braking hard felt controlled and I wasn’t at any point even close to losing the front. It’s surprising how safe the whole operation felt. There are plenty of instructors to watch your riding and provide instant feedback and advice. The last drill before our trail ride was riding over closely positioned speed bumps. This was possibly the most difficult task that we were given. The bumps were so close to each other that you barely had time to throw your bodyweight back to get the front wheel over the bump before you needed to haul yourself forward to stop the rear wheel bouncing off the obstacle, then the same again for about a dozen times. Get it right and the obstacles seem nothing but little ripples on the surface, but get it wrong and you feel like a punch bag. For me it was mostly the latter – plenty to practise there! The finale for the day was a 20 minute trail ride on the fantastic and varied tracks in Walters Arena. The arena is an adventure riding wonderland, with trails, jumps, ruts, and everything that the Welsh countryside can throw at you. We picked some easy trails with a few climbs and descents. After Beppe’s drills the riding seemed easy, and I tried to use my body positioning as I had been instructed to do. Sometimes it worked, sometimes I got it wrong – like the time I wasn’t fast enough to move forwards going over a big rut and the rear end jumped up and punched me in the behind. Riding in a straight line is no as easy as it sounds. But even with the mistakes, I was already improving my riding after just an hour of training. 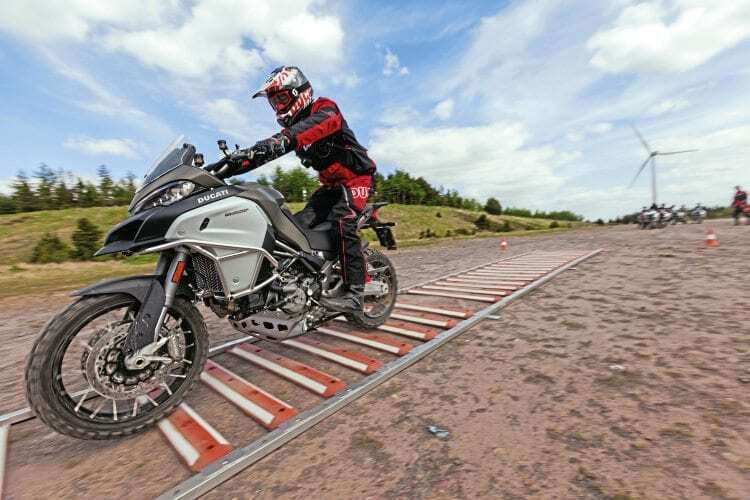 In addition to the new skills, a real revelation was just how manageable the big Multistrada Enduro is when you have the skills to ride it properly. It can steer lightly and in next to no space, glide over obstacles like a lightweight trail bike, and stay composed even in a slide with the rear wheel locked. I was expecting to find myself in a heap on the ground more than once, but the big twin kept me safe and sound, and made me look like a better rider than I really am. Moving on the bike is key to the training – and it’s hard work! The idea of the taster is not to turn you into a lean, mean off-road machine, but to give you an idea of what the full course could offer. Even so, I felt like I had already picked up quite a few tips that I could put into practice on my own, and it did leave me with visions of myself riding among the vines in Tuscany. If I could improve this much in an hour, imagine how much a day and a half with these guys would help my riding! The full course in Italy is definitely one for my bucket list! The most important thing is to understand the obstacle in front of you. If you don’t understand the obstacle, you don’t adopt the right technique, and you can find yourself in trouble. If I have a situation where I have an obstacle followed by a corner, I read the obstacle first, but by the time I’m negotiating the obstacle, I am already looking at the corner. It’s important to look as far as you can to have an advantage and buy yourself more time to negotiate different obstacles. If you look at your front wheel, you crash for sure. If you look forward, you can assess the obstacle nice and early. Another thing that is important to me, something that I teach all the time at the school is that when you ride motorbikes off-road, never, never relax. You need to concentrate fully all the time. A lot of road accidents happen because people don’t concentrate too. We look at the sat-nay, we look at the Phone, this is the reason for the accidents. This is really important. Having the right equipment is very important. Several people ride their bikes wearing tennis shoes – with equipment like that a simple crash, a small mistake becomes a big problem. 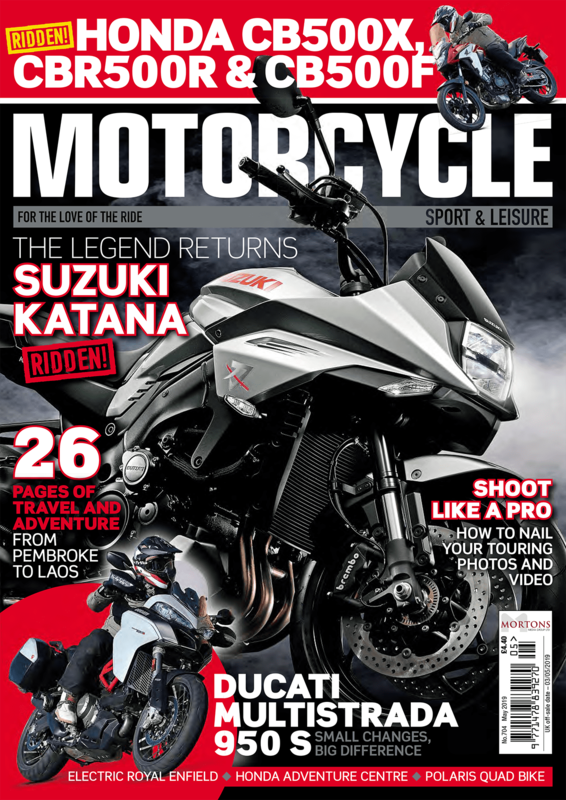 I can’t understand the people that ride without back protectors or proper motorcycle boots – that’s just asking for problems. It surprises me that some people don’t take care of the instrument that is the bike. A lot of people don’t check the tyre pressures, they don’t check the chain, they just don’t take care of the bike. If you are going to ride your bike, you have to be sure that it is in good condition. You don’t want to discover that you have a problem when you’re trying to negotiate an obstacle – much better to check the bike before you ride. A lot of people don’t take good enough care of themselves physically. You need to be in a reasonable shape to ride off-road, otherwise you will get tired very quickly. It’s also important to do some stretching before and after riding. You know what I do when I start? I start the engine, I warm it up. At the same time I warm up my body with stretching. The body is working with the machine, so you warm up the engine and your body. 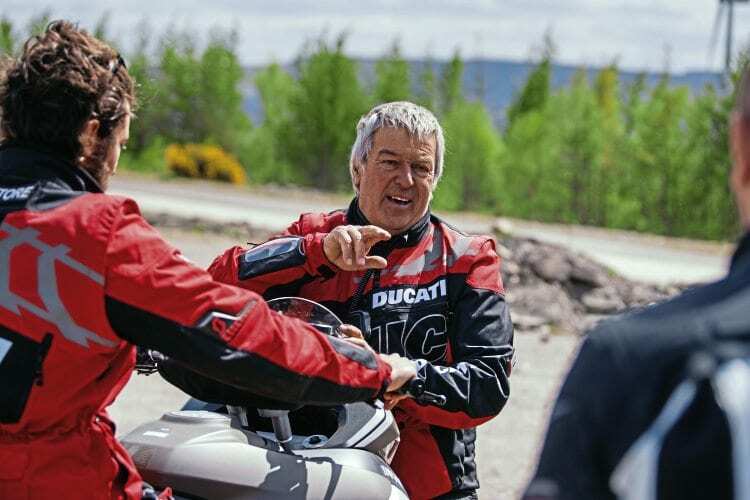 The Ducati DRE Enduro school in Tuscany, Italy, is designed to give big bike owners the skills and confidence to take their pride and joy off the tarmac. 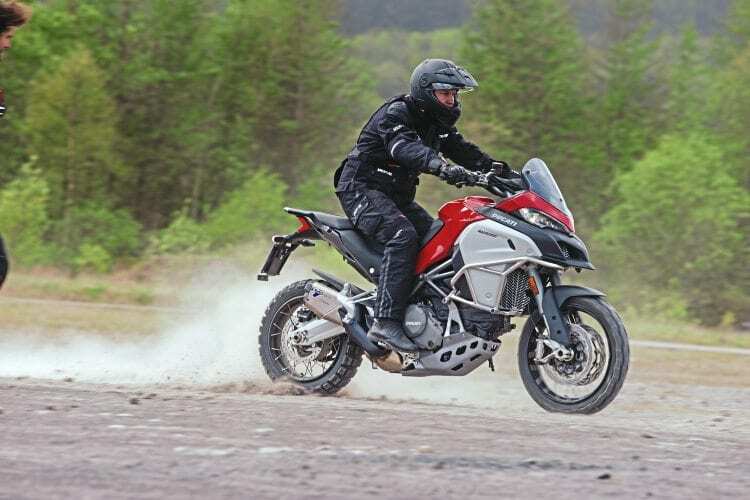 Course fees include the loan of a Multistrada 1200 Enduro, riding tuition, non-biking activities for your other half if they are not into biking. The castle of Nipozzano and 600 hectares of land make the DRE Enduro HQ the perfect place to get to grips with the big adventure bike. 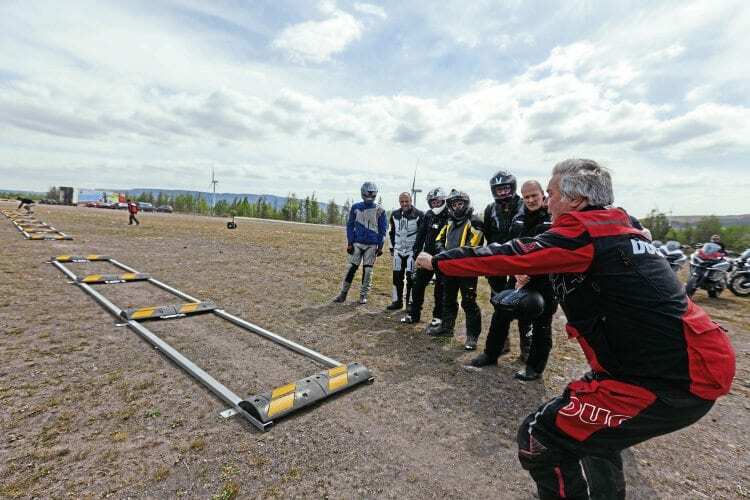 The one-and-a-half day course costs €680, and with travel from the UK and accommodation the total cost could be kept just shy of £1000; not cheap, but it’s as much a holiday as a riding experience. Locking the rear wheel during an emergency stop. Suspension: (F) Sachs 48mm fully adjustable USD forks. Electronic compression & rebound damping adjustment. (R) Fully adjustable Sachs unit. Electronic compression & rebound damping adjustment. Electronic spring pre-load adjustment. Brakes: (F) 2 x 320mm semi-floating discs, radially mounted monobloc Brembo calipers. (R) 265mm disc, 2-piston floating caliper. Cornering ABS as standard.